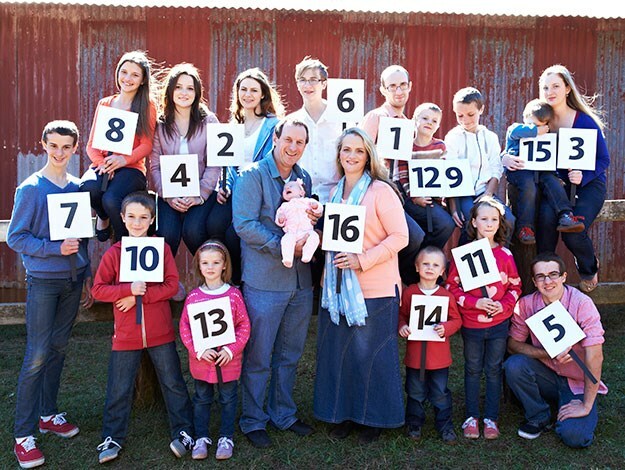 Jeni and Ray Bonnell, the parents of Australia’s largest nuclear family, welcomed their sixteenth child recently, and have named their daughter Katelyn Vera, who was born at St Vincent’s Hospital in Toowoomba. Katelyn joins siblings Jesse, aged 24, Brooke, aged 23, Claire, aged 21, Natalie, aged 19, Karl, aged 17, Samuel, aged 16, Cameron, aged 14, Sabrina, aged 13, Timothy, aged 11, Brandon, aged 9, Eve, aged 8, Nate, aged 7, Rachel, aged 5, Eric, aged 4, and Damian, aged 3. The Bonnells have been featured on the blog earlier, and Jeni and Ray are still open to having more children.